ODIs: More misery for NZ? Cape Town - Lions wicketkeeper/batsman Quinton de Kock could miss South Africa's ODI series against New Zealand after he apparently shoved a Cape Cobras player in their four-day Sunfoil Series match at Newlands over the weekend. According to Die Burger's website, De Kock could be suspended for two matches after he apparently shoved the Cobras' Allister Gray during an altercation at Newlands. 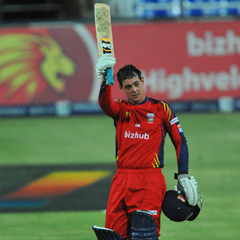 De Kock is part of the Proteas' ODI squad for the upcoming three-match one-day series, which starts in Paarl on Saturday. According to CSA's covenor of selectors, Andrew Hudson, the young 20-year-old was in line to play in the series. Cobras skipper Justin Ontong is reportedly also in trouble after his team was found guilty of ball-tampering by umpires Brian Jerling and Shaun George. Cricket South Africa's spokesperson, Michael Owen Smith, said both players' hearings should be completed this week. "Should the players be found guilty, then it will also affect their participation in international cricket," he said. The drama at Newlands unfolded on Saturday after the umpires accused the Cobras of ball-tampering. The Lions were - as the rules state - allowed to pick a new ball. However, the two batsmen at the crease, Temba Bavuma and De Kock, picked an old worn-out ball which heavily upset the home side. De Kock then apparently bumped into Gray and threatened to hit him with his bat. The ball - which was apparently tampered with - will now be sent to Australia for thorough analysis. Cobras coach Paul Adams was angered by the incident, insisting his side had done nothing wrong. "There was nothing wrong with the ball. It was only 20 overs old and there were only a few marks on it like always. The umpires were unfair towards our team. "It wasn't only us. "They (umpires) also talked to the Lions about the condition of the ball after our second batting innings. "They were unhappy with the condition of the ball, but we never complained about it," said Adams. The Lions won the game by eight wickets. Should De Kock be banned he is sure to miss the Proteas' first two ODI games, with the series ending in Potchefstrooom on January 25.